WCHG’s Annual Tenants’ Conference took place at Wythenshawe Forum on Thursday 8th November and was a huge success. 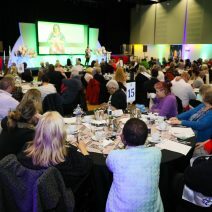 218 people attended the event and enjoyed a packed agenda with special guests Alison Inman from former Chartered Institue of Housing (CIH) President who put the spotlight on ‘Domestic Violence’ and recently launched the #makeastand campaign in June 2018 to tackle the issues surrounding domestic abuse. Other special guests Sally Trueman & Ann Harris from the ‘A Voice for Tenants (AV4T) who have formed a constructive relationship with the government, gave a presentation highlighting the impressive numbers of volunteer hours tenants are donating nationally and played an important role in launching the recent Green Paper. Local Councillor Glynn Evans, Master of Ceremonies on the day, hosted this years “Question Time”, giving attendees the opportunity to speak directly to representatives from WCHG’s senior management team, Mike Kane, MP for Wythenshawe & Sale East and Alison Iman and a record number of 18 questions were asked, providing a unique opportunity for local tenants to get answers to the questions that mean most to them. Chair of the Tenant Committee Janet Papworth said, “It was a great event and I would like to thank all the involved volunteers who helped make the day such a success. It was a fitting tribute to Nigel and everything he has done for Wythenshawe and on behalf of all the tenants we wish him all the best for the future. If you would like to become an involved tenant at WCHG then get in touch to find out more. Alison Inman, former CIH President said, “It was a real honour to be asked to speak at the WCHG Annual Tenants Conference about the CIH, ‘Make A Stand’ campaign against domestic abuse. For too many people in our communities home is not the safe place it should be and it is great to see WCHG taking a lead in trying to change this.